Rackspace came to The Honor Roll seeking a well-rounded campaign to promote Rackspace OpenStack, a private cloud-as-a-service delivery model with 99.99% API uptime guaranteed. We pitched 3 ideas, each featuring potential print ad designs as well as video storyboards. 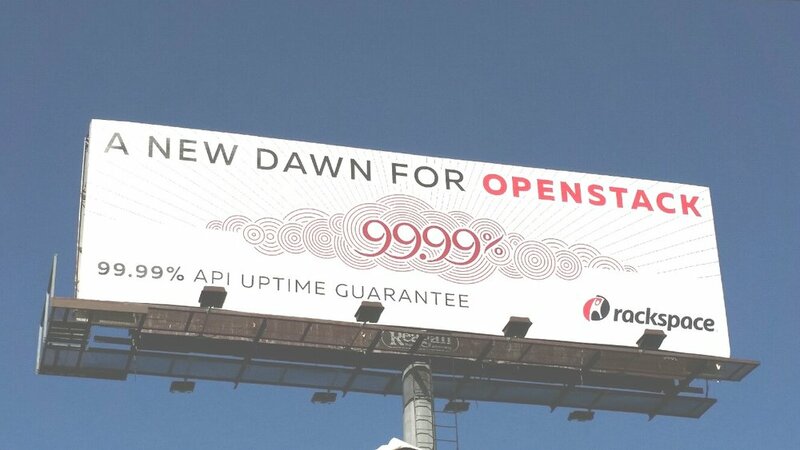 The chosen concept centered around Rackspace OpenStack’s reliability (99.99% uptime, a “New Dawn” for OpenStack) and its ease of implementation. This is one of my first videos ever, and still my favorite so far. Storyboarding this was a lot of fun because I got to experiment with typography—one of my favorite things to do. I learned a lot working on this project about communicating and collaborating effectively with animators. Many of the baggage claim and ETA screens at the airport featured animated ads as well as a condensed (:30) version of the video above. I was tasked to adapt the 99.99% New Dawn concept for a billboard design. They ran in two high-traffic areas of Austin near downtown and the airport. Though the print ad arm of this campaign was ultimately shut down, we did get so far as to get physical proofs from the magazines. I’m including this design here because it clearly showcases the New Dawn artwork and how I reckoned Rackspace’s branding guidelines with the concept.